Enjoy our latest update about Dystopian Wars, Wild West Exodus, Armoured Clash, Firestorm Armada et al. As well as our announcement about Warcradle Classics! Want a quick overview? We have you covered! Prefer to read it in full? The majority of questions asked are answered below, along with all images shown within the Live Stream. Pierre - Facebook: When can we expect new novels to be published? And will you do novels for all parts of the Dystopian Age? A: We have several novels in development from Sarah Cawkwell and Craig Gallant. Once the new background for the Dystopian Age is revealed we will then begin releasing novels that fit into it. Pierre - Facebook: Are there more 'crossovers' planned like the Nakano Gozen miniature which clearly originates from a DW faction? A: As the games share a common setting it is entirely probable for characters, machines and locations to appear in multiple games. 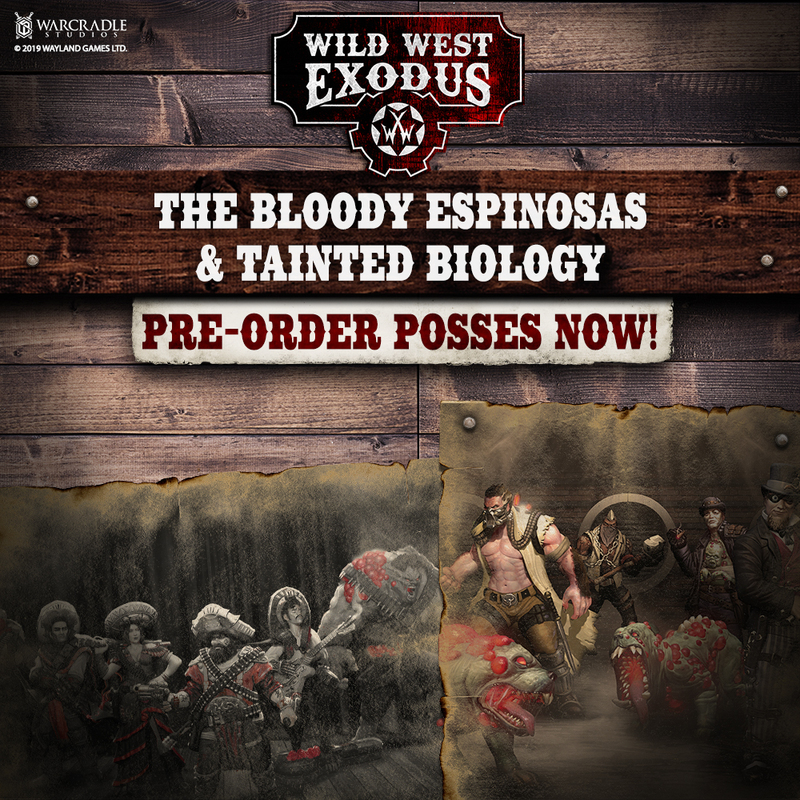 Bruno - Facebook: You have released the campaign Into the Badlands in French for WWX. That’s great! But have you got further plans to translate rules? It would help to develop the game here. A: Yes, we have a translation of the rulebook into French, Spanish and German underway. Spanish is almost ready for print with French and German not too far behind. Jens - Facebook: When will we see the announced full-size hardcover rulebook for WWX? A: Work is continuing on the hardback edition of the rulebook alongside the translations. This will feature the expanded background that ties the game into the Dystopian Age and will include the latest revision of the rules. It will also include the Badlands supplement as well as a host of new material to make it an essential book for all WWX players. As soon as we have a firm release date, we’ll be shouting it from the rooftops! John - Facebook: I thought the campaign game you released recently was great - are there any plans to expand on this? Maybe a scenario book release to move the story on? i.e. story-driven games, characters which will gain more experience and will, therefore, be stronger in each game (or may gain some sort of 'upgrades'). What I like to imagine are games/scenarios which will lend themselves some components from tabletop roleplay games. A: True roleplay is best served by an actual roleplay game (which we would very much like to do for the Dystopian Age). While we will see more narrative material coming for WWX in terms of scenarios and themed posses, the game has a specific balance. Pierre - Facebook: Will the background of some of the major characters be stronger and more deeply explored? Specifically bosses like Lincoln, Carpathian, Laveau (the more global 'players'). A: Yes, in the rulebook as well as in novels and short stories. Jens - Facebook: Any chance of more regular sneak peek videos regarding upcoming releases. And if it’s concepts you are looking for then how about these? Q: Have you started writing the rules yet? A: Alpha testing is underway for the Third Edition of Dystopian Wars. We are on track for a public Beta Test in the Summer. More news on this, next month. Michal - Facebook: Exploding d6 or other dice in DW? A: Absolutely! Exploding six-sided dice are part of Dystopian Wars Third Edition. Q: Will you be making plastic ships for Dystopian Wars? A: We have a whole host of new boxed sets coming out to support the game. While most of the miniatures will be resin, we are developing plastic multi-part cruisers and more! Q: We saw photos of some battleship concept art that were shown at Salute a few weeks ago. Can we have better images? Each showcases some of the visual touchstones of the factions as well as bringing some familiar silhouettes to fans of the previous editions. Jeff - Facebook: Before Spartan went under, they were in the process of making an app for their games: is there any plan to make an app for dystopian wars? A: We have an app in development for Dystopian Wars, yes. More news closer to the launch. Q: How can the Covenant from the second edition become the Covenant of the Enlightened in the third edition. I don’t understand how Sturgeon could have changed so much? A: The Third Edition is set in the Dystopian Age, which is a new setting for the game. Because of this, while some names and characteristics do appear that may be familiar to fans of the previous edition, it is not a continuation. The same is true for games like Wild West Exodus too - the character of Doctor Carpathian is now very different from his earlier incarnation (though, like Sturgeon, he still has aspects of his character and appearance that are familiar). Q: Will Armoured Clash come out the same time as Dystopian Wars? A: No. 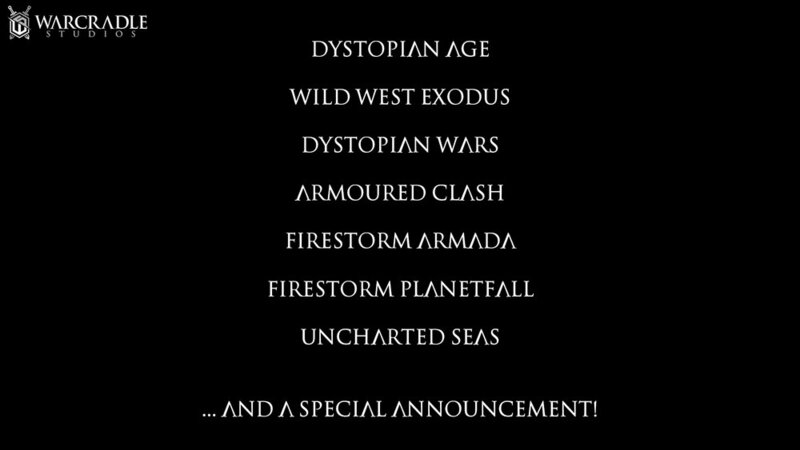 We are launching Dystopian Wars first and then will begin the public Beta test for Armoured Clash later next year. Q: We saw some Dystopian Age aircraft at Salute. Are these from Armoured Clash? Q: What’s the latest with UC? A: We’re quite advanced in the development of the game. There are some exciting elements that are taking longer than we would hope to put into place and so it will be the autumn before we have more news on it at the earliest. Rest assured we are working to make it the best possible game we can and we’re as keen as you are to see the game back on the tables! Lyell - Facebook: Most of your attention to the spartan games IPs seems to be focused on Dystopian Wars. Is there any behind the scenes work happening with the Firestorm universe, and when would you expect that work to become more public, or start if it hasn't already. A: Yes, we’ve begun work on the development of the Third Edition for Firestorm Armada. Both rules and background. This is a huge undertaking here as we think there is a real opportunity for redefining the Firestorm Universe and making it an even more imaginative and exciting place. Q: Can you tell us anything about the new starships coming out? I heard something about plastic Relthoza? A: We have plans for a massive relaunch of the game next year which will include plastic multi-part starships for the Relthoza and many more factions! Q: Will the new FSA have a different scale? A: No the starships will be in the same scale as before, but expect to see some familiar races and names as well as many new ones. Visually each faction will be even more distinctive too. Here are a couple of snapshots we managed to get. More news as we can sneak it out of the studio! Q: What is happening with Planetfall? A: As we develop the Third Edition for Firestorm Armada we are making sure that the narrative includes a strong element of the ground conflict of Planetfall. Expect to see more news on Planetfall once the public Beta test for Firestorm Armada begins next year. Finally, we have some exciting news from our manufacturing team. From June 2018, under the banner of Warcradle Classics, a number of miniatures from the Dystopian Wars and Firestorm universe ranges will begin to become available again in limited quantities. As our team continues works through the old Spartan moulds and masters, we have been testing them with different resin formulations and techniques to get the best possible results. While some of the moulds have proven to be too badly damaged or otherwise unusable, there are several different models produced each week that are of a high enough quality to be made available to customers. Customers will be able to purchase these products online or through their local stores as these limited production runs will also be available to our retailers in their trade orders. The nature of the generic packaging will mean they are unlikely to look their best on a retail shelf but we want the products as widely as possible for customers to expand or complete their classic collections.